This is perhaps the best known poem of all in praise of West Lake. The great Northern Song poet Su Dongpo (1036-1101) here meant when he compared West Lake to the famous ancient Chinese beauty, Xi Zi, well-known for her natural beauty, West Lake always looks beautiful. Xi Zi is as famous in China as Cleopatra in the Western Countries. So western visitors can really appreciate and enjoy the poem and the exquisite Lake. The West Lake is the attraction that contributes to the city's reputation as the most popular resort area in China. 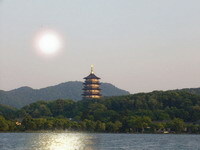 Foreign tourists often write to us, saying " West Lake is the most abiding memory of Hangzhou and of out China trip as well" Though its pictureque beauty has been beyond description through the ages, the lake has often been imagined, through a legend, to a dazzling pearl dropping from the sky. The picturesque lake is well matched with the emerald surrounding hills where quite a number of springs, streams and caves can be found. To name some notable ones, there are Tiger Spring, Dragon Well Spring, Jade Spring, the Rosy Cloud Cave, the Yellow Dragon Cave. They are all highlights of Hangzhou visitors who come to this "Shangri-La" for pleasure seeking. Rich in cultural relics, the West Lake scenic area abounds with temples, pagodas, steles and rocks cavings of Buddhist images. Lingyin Temple, for example, is one of China's most celebrated Buddhist monasteries. In its main hall, there sits a 24.8-meter-high (81.5-fot-high) statue of Sakyamuni. The delicate workmanship makes it a masterpiece of carving art appreciated by anyone who beholds it . In front of the temple stands the Peak Flying from Afar, on the hillslopes of which are carved 470-odd Buddhist images. Dating from the Five Dynasties. And the Southern Song Dynasty steles inside General Yue Fei's Temple are among the top-notch ancient stone tablets in China. Moreover, ancient aarchitectural marvels such as Pagoda of Six Harmonies, the White Pagoda, Baochu Pagoda, and Lingyin Temple have particular fascination each to interest the seeker. Indeed, West Lake boasts too numerous sights to count. Leifeng Pagoda is one of the renowned scenic spots in Hangzhou. Originally built in the 10th century, Leifeng Pagoda used to stand in front of Jingxi Temple on Nanping Mountain; though failed to stand the test of time, the Pagoda collapsed in early 1900s. In 2002, Leifeng Pagoda was reconstructed; then comes back the typical Sunset Glow over Leifeng Pagoda, one of the "Top Ten Charming Views " of West Lake, as the Pagoda looks especially majestic when surrounded by the golden hues of the setting sun. With combination of a traditional aesthetic style and modern architecture techniques, Leifeng Pagoda affords a view of West Lake in its entirety. Nestled in a remote valley at the foot of the Northern Peak,Lingyin Temple is the most celebrated spot of interest around West Lake. In 326 A. D., when an Indian monk called Hui Li came to Hangzhou and found this valley in quiet surroundings with wooded hills on three sides, he thought it was really a retreat of the soul. So he built a temple there and named it Monastery of the Soul's Retreat. Here, "soul" means "ling" and "retreat" means "yin" in Chinese. Therefore, Monastery of the Soul's Retreat is locally known as Lingyin Temple. In the 10th centry during the Kingdom of Wuyue with Hangzhou as its capital, the temple consisted of 9 buildings, 18 pavilions, over 72 halls and 1300 rooms for 3000 monks. Since then the temple has remained one of the ten largest Buddhist temples in China. The buddhist images, a group of relief clay sculptures and others in it have attained an artistic level which is the admitation of modern artists. The main hall in the temple, also called as the Hall of mahavira"great hero" is a typical kind of Tang-Dynasty-style structure in three layers. It has vermillion pillas, green beams, up-turned roof corners and a roof-top decorated with the design of "Double Dragon Striking for a pearl." At the center of the hall sits a 19.6-meter (64.4 foot)-high statue of Sakyamuni, founder of Buddhism, caved out of 24 pieces of camphor wood and gilded with 104 ounces of gold, It is China's largest sitting statue of Buddha at present. Directly facing well-known Lingyin Temple stands a hill peculiarly named the Peak Flying from Afar. This 209-meter (686-foot) peak is covered with odd-shaped rocks and green woods with a streamlet meandering along its foot. There have been different legends about the name of the peak. According to one of them, when the Indian monk Hui Li, founder of Lingyin Temple, saw the spot, he claimed, "It's a portion of Mount Grahrakuta. Why has it flown here?" when asked to show his evidence, he replied, "In its cave live two monkeys that have cultivated themselves for ages. I'am sure they must have come with the peak" So saying, he went to the entrance to the cave to call the two monkeys out. Much to the surprise of the people, out came two monkeys, one black and the other white. People began to believe the monk and gave the peak a strange name --- Peak Flying from Afar. The Peak Flying from Afar is endowed with the fine spirits of universe. Dotted inside its main caves and on its steep slopes along the stream are more than 345 stone carvings, which date form the Five Dynasties, Song and Yuan Dynasties (10th-14th centuries). These stone carvings have been listed as one of the national monuments. Among them, the representitive statue is Maitraya Buddha with his beer belly and smiling face, which is vivid, lifelike and particularly attractive. The statue is located on the south side of the Cool Spring. Yue Fei's Temple and Tomb are situated at the southern foot of Qixia Hill. Surrounded by the imposing red walls, the temple and tomb face Yue Lake, a part of West Lake. It was built in memory of Yue Fen in 1221, a renowned general in the Southern Song Dynasty. Inside are Martyry, Ancestral Temple of Loyalty and Cemetery of Yue Fei. The preserved tablet "Recover our lost territories" above Yue Fei's Statue in Ancestral Temple of Loyalty was a script of Yue Fei. Situated at the foot of Daci Hill southwest to the West Lake, Tiger Spring ranks the third best in China. "Dragon Well Tea" and "Tiger Spring water" are rated as two uniqueness of the West Lake. According to the experts, the mineralization of the spring water is as low as 0.02 - 0.15 gram in every liter because the water is seeping through quartzite contains little dissolved matters. Therefore, its water is pure and clear. Tests show that the water is contributive to people's health. This attraction is featuring the springs. Along the foot of the hill, there is a streamlet meandering. It is a pleasant experience to listen the spring there. Walking along the path, you will see a tiger status at the foot of the Luxuriant Green Cliff. From the left side of the cliff is the source of the spring. This place gives you a very happiness to watch the spring. Then, you can have a seat in a tea house near the cliff to enjoy a cup of Dragon Well green tea brewed in Tiger Spring water. You will find the spring water can bring out the best in each. It is called "spring taste". The major attractions of this area include: the Tiger Spring Temple, the Tiger Spring, the Luxuriant Green Cliff, the Five Dynasties Sutra Pillars, Tiger Status, "Hongyi " Monk Tomb, the Hall of Jigong Monk, the Bell Towner and the Arhat Hall etc. A legend goes that there used to be a monk who disguised himself as a carefree monk named "Daoji". This monk is known as a Robin Hood in China who left a lot of popular stories. Now there is a Monk Ji Gong Memorial which is specially built to commemorate him. With the continuous renovation, the Tiger Spring Temple now is a very nice garden featuring the odd rocks and the sweet osthusman trees. Jingci Templ, or Monastery of Pure Benevolence, is noted for its Evening Bell Ringing at Nanping Hill, one of the traditional "Top Ten Charms" of the West Lake. The bell at Jingci Temple is struck twice daily, with 54 stokes in the morning and in the evening respectively. There are a couple of explanations about the number of 108 strokes. One of the explanations is that the number 108 auspiciously corresponds to the total number of 12 months and 24 solar terms and 72 five-day periods that the Chinese lunar year has. "Give us one day, we'll give you one thousand years!" That is the special slogan of Song Dynasty Town. Bordering on the Qiantang River in the south and lying close to five-cloud Hill in the north, Song Dynasty Town is situated in the southwest part of West Lake scenic area. Covering 20 hectares ( nearly 50 acres ), it is perhaps China's largest theme park of Song Culture at present. Song Dynasty Town embodies the culture of both Northern Song and Southern Dynasties, thus establishing itself as the tourist center of Song Culture. Based on the Riverside Scene at Qingming Festival by the noted Song artist Zhang Zeduan, the town is constructed by means of realistic, romantic functionalist gardening. The flourishing scene of the Song capital is reproduced in the Song style. The scenery as whole is characterized by variety, gradation, rhythm, charm and timehonored touch. With various ledendary scenes, picturesque views and moving sights which stem from history and yet appear to be on a higher plane than history itself, Song Dynasty Town represent a wonderful picture in heaven. The special highlight of the Song Dynasty Town is the grand show of the Romance of the Song Dynasty. It is is a full-length singing and dance performance, based on the historical allusions and mythologies in ancient Hangzhou, merged with the performance of singing, dancing and acrobatics. With the help of modern hi-tech, the performance takes overwheling visual effects as if the spectators were in a dream. The performance can compares well with the Moulin Rouge of Paris, France and the Show of Las Vegas,U.S.A. The performance has attracted over 5 million people since it came into stage 8 years ago. To some extent, the tourist who has not watched the show is not a true one visiting Hangzhou. Cloud song and dance by West Lake be ended anyhow? That they simply take Hangzhou for the old capital." Six harmonies pagoda stands by the Qiantang River. It is a must for tourists to Hangzhou. It is one of the most prominent wood-and-brick structures of ancient China. The name of the pagoda is related to six codes of Buddism. Six harmonies mean the harmonies of body, mind, speech, opinion, wealth and abstinence from temptation. According to historic accounts, the pagoda was constructed first in 970 during the Northern Song Dynasty by Qian Hongchu, the king of Wuyue, who ruled the area of today's Jiangsu, Zhejiang and Fujian provinces. The purpose of building the pagoda was to suppress the tidewaters. Since there was a temple called Temple of Six Harmonies, the pagoda was named accordingly to signify the harmony of heaven, earth, and the four directions of east, west, south and north. This is another explanation of the the name. The pagoda was constructed on a grand scale at first. It had nine storeys and was some 150 meters high. During the night lanterns were lit on the pagoda so that ships and boats on the Qiantang River could use it as a navigation tower. The pagoda has suffered repeated damage over its more than a thousand years. In 1121 it was almost completely destroyed by war. Reconstruction started in 1153 and was completed in I163. The height of the pagoda was reduced after reconstruction because there were only seven storeys left of the original nine. Major repairs were made again in 1524 during the Ming Dynasty and in 1735 and 1900 during the Qing Dynasty, but these repairs were to the outside eaves only. The brick body of the pagoda remained the same as in the Song Dynasty. Today some Song Dynasty inscriptions can still be found inside the pagoda. Yellow Dragon Cave is one of the "New Top Ten Charms" of the West Lake. Before it has long been a Taoist resort known for its mysteriousness, square bamboo, and Taoist relics. At present, a special garden of folk customs, called Good Luck Garden has been developed at the former site of Yellow Dragon Cave. This garden features only one Chinese character - yuan, attracting countless tourists with brand-new sights. yuan contains many meanings: relationship by fate; predestined relation; bond; natrual affinity; sympathy(agreement in feelings); friendship; marriage; and destiny or luck as conditioned by one's past, or karma in Buddhism. In this Good Luch Garden, we will experience Chinese lucks. Dragon Well Tea is well known worldwide, the water of dragon well is sweet and nice. The green tea of here enjoys very high reputation since Ming Dynasty. Dragon Well is formally called the Dragon pool. In ancient time, local people believed that this well connected with the sea and a dragon lived inside. Dragon Well is one of the five famous West Lake springs. Dragon Well spring water gushes out from a rockfact to collect in the well and flow on through cracks in the rocks. To have a seat and enjoy a cup of Dragon Well tea beside the Dragon Well, what a wonderful experience it is. Dragon Well is a circular pond 2 meters in diameter, the spring water drains down to a brook along the Yingma bridge, Huangni Hill and finally winds it way into West Lake through Mao Jia Bu. What is more interesting to see is a "dividing line" on the surface of the well water when it is stirred, a line that, like a hair spring and disappears slowly. Dragon Well tea is well - known for its four special features: green color, fragrant aroma, sweet taste and smooth even appearance. West Lake green tea has four varieties named Lion, Dragon, Cloud and Tiger. Among them, Lion and Dragon Well Tea is the best. During his visit to Fair South, the Qing emperor Qianlong designated "Eight Scenes of Dragon Well" with his inscription for each scene. The best well known one is Pavilion of Going beyond the Brook, which is constructed on Tiger Brook Bridge. This beautiful spot is located in Huagang ( Flower Pond ) park, which lies between Western Hill and Su Causeway. According to local history, there used to be a tiny creek that flowed from nearby Flower Hill into West Lake, so later people name here the flower pond. Usually, a boat ride on West Lake and Huagang park that features the red carp are put together as part of a day's itinerary. Two fish ponds in he park is a must for visitors. Bending over the rails of the bridge and watching the carp noisily scrambling for food thrown to them is a fantastic experience. A stone's throw away from Hangzhou Shangri-La Hotel is a 2.8-kilometer (1.74-mile)-long causeway stretched to Nanshan Road near Huagang Park. The causeway is identified with the Northern Song Dynasty poet Su Dongpo. It was built of the dredgings of the West Lake when he organized a large-scale dredging of the lake during his second term ( 1089-1091) as the city's governor. Six single-arch stone bridges were constructed to grace the causeway spanning the lake from north to sourth. To name one, there is a "Crossing-the-Rainbow Bridge", viewed from afar, the causeway resembles a perfet rainbow spanning the lake. The moment you cross the bridge, you cross the "rainbow". Lied with peach, willow and osmanthus along its entire length interrupted occasionally by the beautiful pavilion and colorful flower-beds, it is really an attractive walkway in the daytime, as well as the lovers' lane in the evening. Situated on the north bank of the West Lake, Precious Stone Hill is over 200 meters (656 feet) high. Its scenic feature is many red rocks spreading all over the slopes of the hill, which sparkle like diamonds inlaid in the rosy morning or evening sunlight. This is how the name of the hill is given. Usually local people ofthen come here for leasure time or doing morning exercises. Seldom has visitors coming here for a tourist site. However, you will be surprised by the excellent view of West Lake when you clim on the top of the hill. It is also the best spot for the photographers to catch the beauty of the lake. Bai Causeway stretched from the Broken Bridge to a lakeside park called Autumn Moon Over the Calm Lake. The causeway is named to commemorate the great Tang Dynasty poet Bai Juyi, who did a lot for the local people as governor of Hangzhou. This one-kilometer (0.62 mile)-long embankment lined on both sides by pink peach blossoms and weeping willow trees planted at regular intervals was a favorite spot for enjoying the beauty of the lake, either in rain or in sunshine. The broken bridge, located at the east end of the Bai Causeway is one of the Top Ten Attractions of the West Lake. it is the famous lovers' bridge of West Lake. in the daytime, it sees young lovers ride boats happily in the Lake. After dusk, it sees the brenches along the Bai Causeway filled up with young lovers.